It’s just 7am, and I am sitting in the Hynes Convention Center, staring at the open door to the bookfair where, in about two hours, I will bury myself. For now, though, I’m alone here except for the security guard at the door of the fair and the man running a vacuum. We got eight inches of snow here today, so we’re a lower to rise group, I think. I even took a cab to cover the one mile from my hotel. 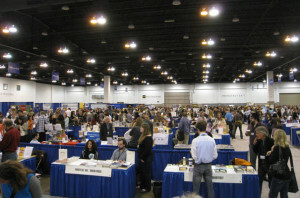 Sometimes AWP is an exercise in indulgence. In a bit, I will be having breakfast with faculty and alumn from my alma mater, Antioch University Los Angeles. I expect I will not know most people, but I’m eager to know them more – these people who share my desire to write and also see social justice brought through my writing. Then, I will search through the 10,000 (or more?) square feet of the book fair for people I love. I know that’s a strong word to use – “love” – but it’s the only right one. Whether they are folks I know through coffee conversations and classes or people I have come to love because of the way their words work on me, I love them. I may not tell them so in those words – no need for that security to have to do more than guard the door – but I will show them with my smile and my few minutes in this sea of 12,000 faces. I may have lunch with another friend and perhaps dinner with others. P will join me at lunch, and we will hit Cheers! after I do a quick story pitch interview with Jane Friedman of Virginia Quarterly Review. Wish me luck? Tonight, P and I will find some more good food and chat together about the day. I expect I will have another version of a martini – Lemon Drop and Dirty Martini, I’ve covered already. It will be a good day. As was yesterday when I had lunch with Vicki Hudson, whose book No Red Pen is a must-have for anyone in a writing workshop or who teaches one. (The electronic version is available for free here.) and Meghan Barnes, whose memoir For the Love of God is available here. This is how we come to love each other – over long lunches and book talk. It’s not a bad life. 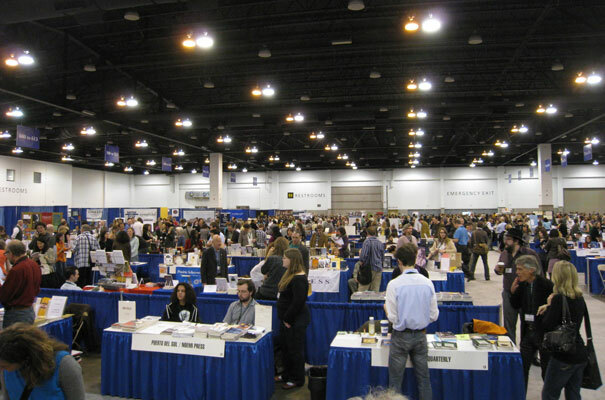 So hit me – 10,000 square feet of book store with publishers, MFA programs, authors, and literary magazines – who would you try to see if you were here? I’ll do my best to say it for you. Don’t forget, if you sign up for my newsletter (at right), I’ll be giving away some MFA goodies next week. . . copies of lit mags, great pens, funky stickers, and maybe even some books. Plus, you’ll get in on a great introductory rate for my first grammar intensive that starts in April.